Professor Peter Russell, OC, FRSC, author of Canada’s Odyssey: A Country Based on Incomplete Conquests, is our guest speaker for Craddock Sunday at Bloor Street United Church (300 Bloor St West), November 18th. Can Canada’s Three Foundational Pillars Slay the Pernicious Claim of Sovereignty? Professor Peter Russell, OC, FRSC, author of Canada’s Odyssey: A Country Based on Incomplete Conquests, is our guest speaker for Craddock Sunday, November 18th. Peter H. Russell is Professor Emeritus of Political Science at the University of Toronto. He was the second Principal of Innis College and the foundling Principal of Senior College, the U of T’s youngest college for its oldest scholars. He has published widely in the fields of judicial, constitutional, Aboriginal and parliamentary politics. His most recent book, published by the University of Toronto Press in 2017, is Canada’s Odyssey: A Country Based on Incomplete Conquests. He is now working on a book that will be entitled, Sovereignty: A Pernicious Claim Whose Day is Done. Peter Russell is a past President of the Canadian Political Science Association and past Chairman of the Churchill Society for the Advancement of Parliamentary Democracy. He chaired the Research Advisory Committee for the Royal Commission on Aboriginal Peoples and co-chairs the Canadian Political Science Association’s Truth and Reconciliation Committee. He is the recipient of numerous honorary degrees, a Fellow of the Royal Society of Canada and an Officer of the Order of Canada. On Sunday, September 23, we have a very special schedule of events. You don’t want to miss it! 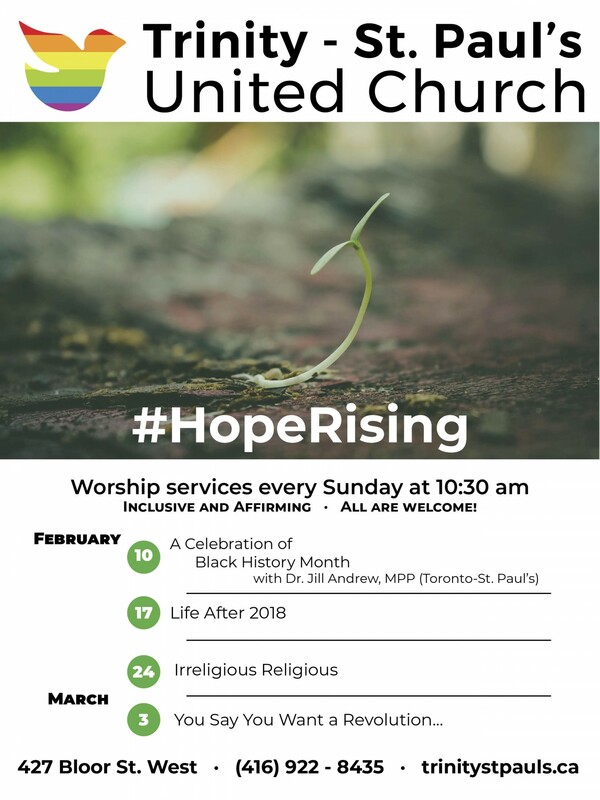 Starting worship at 10:30 with guest preacher, Dr. Colin Phillips, moderator nominee to the 43rd General Council of the United Church of Canada. Worship services are every Sunday at 10:30 am. Join us! Following worship service, there will be a Naming Ceremony and Potluck Feast after coffee time. It’s time for a little “good news”. TSP welcomes our new Children’s Church Coordinator! Lorna Craig is an actor, director, and community arts facilitator based in Toronto. She has worked with children and youth for 15 years, most recently collaboratively creating plays in Montreal from 2013 – 2017. She trained as a puppeteer with Bread and Puppet Theatre and Puppetmongers, most recently creating and performing mobile puppet shows on Toronto Island with Shadowland Puppetry. In 2015 she coordinated a research project at Concordia University, The Encounters Project, that used performance to explore theatre’s ability to investigate conflict across cultural divides. In the fall of 2015 she directed on life and living, a documentary theatre piece based on personal stories from ‘AIDS Community Care Montreal’, an HIV/AIDS support network. While travelling in India in 2017, Lorna directed and narrated The Christmas Story pageant at the Hairakhan ashram in Haldwani. This summer she coordinated and facilitated The White Rabbit Arts Residency at Red Clay Farm in Nova Scotia. Lorna spent much of her childhood at TSP so is thrilled to be returning to her old stomping grounds as the new Children’s Church Coordinator. Also, there will be… bannock-making?! On September 24, join us for We ARE the Earth! at Church of the Redeemer. Our celebration of A Season of Creation continues with a panel discussion with The Rt Rev’d Mark MacDonald, National Indigenous Bishop – Angican Church of Canada, The Rev’d Dr Cheri DiNovo, Minister at Trinity-St Paul’s United Church and former MPP Parkdale-High Park, and The Very Rev’d Dr. Bill Phipps, Co-founder and Board Member, Faith & the Common Good. This Welcome Back Sunday (Sept 9), join us for a sermon with Cheri DiNovo titled, “The Church As Our Body” where we explore images of early Christian gatherings and modern persecuted communities. VIVA! Youth Singers is GROWING. And HIRING!